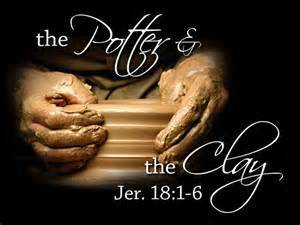 God is the potter and we are the clay, a vessel formed of which He works through. Some are vessel’s made unto honour and another unto dishonour. (Romans 9:21-24). Hath not the potter power over the clay, of the same lump to make one vessel unto honour, and another unto dishonour? What if God, willing to shew his wrath, and to make his power known, endured with much longsuffering the vessels of wrath fitted to destruction: And that he might make known the riches of his glory on the vessels of mercy, which he had afore prepared unto glory, Even us, whom he hath called, not of the Jews only, but also of the Gentiles? For those who knew Saul before he was on the road to Damascus, little did they know that the one who persecuted the church would turn out to be a chosen vessel fit to carry out the work of the Lord! (Acts 9:13-16). Then Ananias answered, Lord, I have heard by many of this man, how much evil he hath done to thy saints at Jerusalem: And here he hath authority from the chief priests to bind all that call on thy name. But the Lord said unto him, Go thy way: for he is a chosen vessel unto me, to bear my name before the Gentiles, and kings, and the children of Israel: For I will shew him how great things he must suffer for my name’s sake. God can take that which is broken and form it into something that is useful to serve only Him, as Jeremiah found out when he visited the Potter’s House. (Jeremiah 18:1-6). The word which came to Jeremiah from the Lord, saying, Arise, and go down to the potter’s house, and there I will cause thee to hear my words. Then I went down to the potter’s house, and, behold, he wrought a work on the wheels. And the vessel that he made of clay was marred in the hand of the potter: so he made it again another vessel, as seemed good to the potter to make it. Then the word of the Lord came to me, saying, O house of Israel, cannot I do with you as this potter? saith the Lord. Behold, as the clay is in the potter’s hand, so are ye in mine hand, O house of Israel.